Why On-Board Managed Service Providers for your Cloud Strategy? Cloud is being embraced quickly by organizations. Organizations move from legacy infrastructure and traditional hardware setup to Cloud to reduce total cost of ownership, improve disaster recovery and get multiple other benefits. According to Gartner, the global market for public cloud services is set to grow 18 percent by the end of 2017, adding up to a total of $246.8 billion. 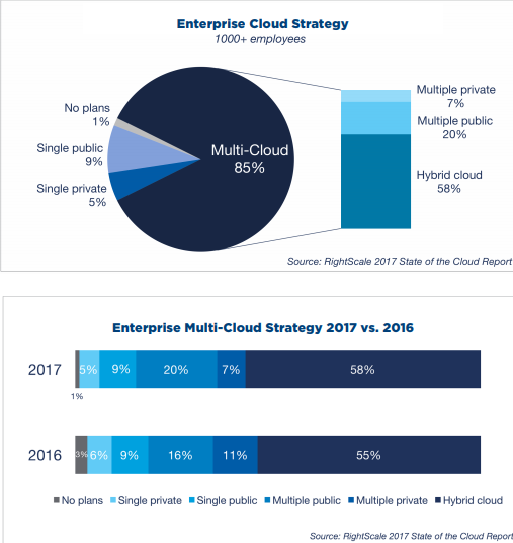 According to Rightscale State of The Cloud Report 2017, more and more companies are adopting a multi-cloud strategy to amplify scale and receive benefits faster from Cloud. This journey to cloud is not a simple one though. An increasing number of organizations are steadily realizing the advantages of partnering with Cloud Managed Service Providers (MSPs) who have expertise in building and managing Cloud Services to support organizations in their journey to cloud transformation. In such instances, Cloud Managed Service Providers can manage your cloud infrastructure-be it multi-tenant or hybrid, and close service gaps, if any. They have expertise in cloud computing, managing cloud security, storage, network operations, application stacks, performance testing, IT health monitoring, reporting, recovery, infrastructure migration, change management and more to ensure continuous delivery pipeline. Assess the vendor’s end-to-end capabilities- from planning and migration to maintenance and optimization. Measure the industry or vertical specific expertise. Check the Cloud Services or Providers in their support ecosystem. Assess their best practices, tools, collaboration models. Organizations can afford to become lean by tying up with a Cloud Managed Service Provider. Earlier, organizations had to maintain separate teams for network admin, server admin, storage admin, virtualization admin, and data center operations team. With a Managed Service Provider, enterprises can do away with these separate teams. The Cloud Service Providers look after application deployment, does fine tuning of servers and applications, manages infrastructure-as-a-code, and performs high-value tasks while the in-house Developers can focus on their development work. With Cloud Managed Service Providers on board, organizations do not have to worry about managing complicated devices (such as Firewalls, NetApp Storage), hardware failures and their replacement. The managed services team nowadays follow Agile Methodologies and DevOps best practices using tools such as Puppet, Ansible, Jenkins, etc. and utilizes Chef/ OpsWorks for configuration management. Apart from the above advantages and associated cost advantages, on-boarding a managed service provider for your cloud environment is a smart move. 1. Performance Monitoring- Effective Performance Monitoring strategy is a must for preventive maintenance initiatives on the cloud. Since 2010, the cost of downtime has steadily increased by 41 percent. As per a study, data downtime can cost as much as $7900 a minute! Cloud outages are not uncommon. Recently at the beginning of the year, GitLab experienced an 18-hour outage owing to a human error that affected 5000 projects, 5,000 comments, and 700 new user accounts. Facebook, Amazon and many other global giants had witnessed downtime due to human errors, hackers or other technical glitches. Cloud performance monitoring is much more than monitoring disk, VR memory or CPU usage. Cloud MSPs have expertise in proactive monitoring strategy that includes monitoring performance, security, throughput, uptime, capacity, SLAs, KPIs, user metrics, log files and more. End-to-end monitoring of infrastructure is essential to optimize performance, put an alert mechanism in place for detection of issues, reduce downtime, and monitor network traffic and efficient scheduling of maintenance. Cloud Managed Service Partners make effective use of available tools like New Relic for server monitoring, Pingdom for application monitoring, PagerDuty for alerts and more. 2. Security- In 2016, the cost associated with IT breaches averaged $ 2.5mn per incident. One of the recent incidents being hackers leaking the much-awaited episodes of Game of Thrones. Though fans lapped it up, HBO faced some serious security lag issues. Security breaches not only costs dollars and customers but also brand reputation can go for a complete toss. A comprehensive cloud security management strategy is important to tackle outages, data loss or security threat. More often than not, internal IT resources are not adequately skilled for managing these cloud security threats. Partnering with MSP’s that brings value to the table with the experience they have in managing cloud environment is a smart strategy. The device data security strategy that is specific to the client cloud environment. MSPs are competent at developing, deploying, implementing and managing these security controls. Specialized service providers like Cloud MSPs are ideal partners to tackle the rising number of attacks and threats. 3. Disaster/Recovery Management- Business Continuity is essential even during massive outages. One of the leading services provided by cloud MSPs is disaster management. These MSPs design data centres and networks that are resilient enough to maintain business continuity even during disasters with minimal downtime, ensuring that your data is secure across all services and applications. 4. Replica management- Data replication across multiple sites in the cloud has become a go-to strategy to ensure optimal performance in terms of load balancing, response time and availability. Replication can markedly bring down access latency as well as bandwidth consumption as it increases resource availability, brings in consistency and reliability. The advantage associated with replication management is that it is a proactive approach towards tackling system failure. However, replication management is not an easy task and comes with maintenance overhead. It is difficult to execute in-house, hence outsourcing replica management to cloud MSPs can make data management simpler for organizations. Cloud MSPs have the required expertise to handle data replication. Replica management depends on storage requirement, load variance, latency, and the probability of failure and service time. Public Cloud Managed Service Providers ensure data consistency during the replication process, monitors downtime during new replica creation, takes care of replica storage maintenance, decreases latency time, balances workload, minimizes execution time, ensures scalability and availability and fault tolerance. 5. Compliance- Many organizations need to follow industry specific rules and regulations for their IT initiatives, for privacy, information security and reporting. The Banking/Financial Services industry and healthcare industry, for instance, have complex compliance checklist to follow. Alliance with cloud managed service partners can significantly reduce the burden of compliance from the in-house team. Managed service providers sometimes have a vertical specific expertise and are thorough with industry specific regulations. They can provide the right systems, reports, and processes to ensure regulatory compliance. Cloud Managed Services Companies have numerous other benefits to offer. Their 24X7 help desk comes in handy when it comes to managing untoward circumstances. Nowadays all Cloud MSPs provide around the clock services. These MSPs provide reactive and proactive management of issues that are fixed within the service SLA. Organizations have a host of services to choose from when partnering with a Cloud Managed Service providers- Managed Infrastructure Services, Managed Network Services, Managed Security Services, Managed Data Center services, Managed Mobility Services and Managed Communication Services. Depending on your cloud strategy you can avail any permutation and combination of these services or choose to avail end-to-end Cloud Managed Services. Take advantage of the cloud without taking on the liability of maintaining and managing cloud deployment, by partnering with a Cloud MSP. Cloud MSPs can significantly complement your in-house resources with access to their technical expertise. If you have any other queries on Cloud Managed Service Providers, feel free to comment in the section below. This was a rather a convincing article on ‘On-Board Managed Service Providers for your Cloud Strategy’ is essential. However, can you throw some light on how these services are priced? And, also the factors that determine?